Dental implants are an effective and popular way to replace missing teeth and are designed to blend in with your other teeth. They are permanently placed in your mouth and provide an excellent long-term option for restoring your smile. A dental implant is a post that resembles a screw, which is a replacement for the roots of the missing tooth. A crown (the visible part of a tooth in your mouth) is placed on top of the post, which will then provide the full functionality of the replacement tooth in your mouth. Dental implant surgery often can be a welcome alternative to dentures or bridgework because the implant acts and looks most like your natural teeth. Ready to have the missing teeth in your smile replaced? Contact Millennium Family Dental today! Dr. Michael E. Risty and the team at Millennium Family Dental will provide a comprehensive dental exam and a treatment plan, which is tailored to your situation. This plan considers how many teeth you need to have replaced and the condition of your jawbone. If your jawbone is not in prime condition, bone grafting can be done. Implants offer firm support to artificial teeth. Unlike dentures, which can move, and slip in your mouth, implants are permanent. This secure fit will feel more natural than typical bridges or dentures. Eat what you want. You will experience a remarkable improvement in your chewing ability and tooth stability. Implants are a good value because they can last a lifetime with proper care. Your dental implants never have to be removed, and your teeth will give you a long-lasting smile you can be proud of. Caring for your teeth will be easy. All you need is a strong daily brushing and flossing routine. Regular visits to Millennium Family Dental are important to the long-term success of your implant to keep it and your natural teeth clean and healthy. Because dental implants return your mouth to a more natural state, it can help fend off periodontal (gum) disease, which will create a healthier mouth and body. Dental implants can also be used to support a bridge when several teeth are missing. Unlike traditional bridges, an implant-supported bridge does not need support from teeth next to it. It is also possible to support an entire arch of missing teeth with an implant-supported denture. Dr. Risty at Millennium Family Dental can explain how the procedure works and answer any questions you may have. Call us for a consultation appointment today. 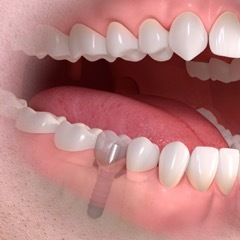 Dental implants are known for securely stabilizing restorations and prosthetics. Your dental implants are placed accurately using a surgical guide for optimal results. While patients wait for their tissues to heal, the post is fusing and becoming a healthy part of the jaw. This process is called osseointegration and allows implants to become a permanent anchor for prosthetics. For patients’ total lack of teeth, ill-fitting dentures become stabilized when attached to dental implant posts. Missing teeth, whether one or a full arch, can lead to bone loss in the jaw, resulting in an aged look. Bone density problems can be corrected by dental implants, however. Dental implants posts act like the missing tooth root and once fully healed, implants remain a part of your jaw, restoring strength through improved bone density. Our dentist in Plainfield creates tailored treatment plans to ensure each patients’ needs are met, from providing choice restorations to implant placement procedure. We utilize guided implant placement and take comfortable impressions of your smile using our iTero machine. Our advanced treatment protocols include soft tissue lasers for faster healing times and easier implant placement. If you’re looking for a brand new smile in one day, we offer same day smiles for patients who require removal of all teeth due to periodontal disease. Implant dentistry at Millennium Family Dental is specific to all our patients’ unique smiles. For more information about our dental implant placement and restoration services, or if you’d like to schedule a visit with Dr. Risty, contact Millennium Family Dental today!